Harris Armstrong's first built work, a house for himself and his new wife Louise, is located at 117 Baker Avenue in Webster Groves, Missouri. Built in 1926, following the couple's elopement on the first of January of that year, it was Armstrong's first opportunity to apply his architectural ideas in a context under his direct control. This view looking from the living room into the dining room is virtually unchanged (save the dining room chandelier) from it's original construction. The unusual archway is the most striking and unusual aspect of the house. The house is presently for sale. You can view the listing here. You can view a series of recent photographs (2007) as well as historical photographs (c. 1927) here. Photograph by Andrew Raimist, May 2007. 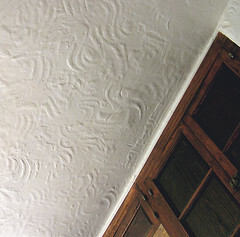 Hand textured dining room ceiling. A great deal of the original plasterwork remains intact in the living room and dining room. The dining room ceiling features hand-worked, randomly wriggling textures apparently done by Armstrong himself. The built-in cabinetry in the dining room is original. Photography by Andrew Raimist, April 2007. 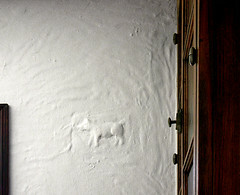 Bas-relief of pig on dining room wall. Armstrong executed a number of bas-reliefs throughout the living and dining rooms on the walls and ceilings. Most of them feature animal or floral motifs. There is also a fleur-de-lis on one wall and a sort of "coat of arms" located over the stone fireplace.